From where I sit in Abuja, the Federal Capital of Nigeria, I marvel at how the country’s football authority has been able to keep active all its football teams in all the major continental and global competitions. At six (6) different levels, Nigeria’s various national football teams have been simultaneously competing at the highest levels in the beautiful game of football. Its senior national team, the Super Eagles, while awaiting Swaziland and Egypt for its respective World Cup and AFCON qualifiers, busied itself with international friendlies in Belgium against DR Congo and Cameroon while other nations played World Cup and Europe qualifiers. Just the past weekend, its home-based players defeated Burkina Faso in the CHAN qualifier with eyes on Rwanda 2016. The same weekend was climaxed with its U-17 team called the Eaglets, beating the US en route to its 5th title at the ongoing FIFA U-17 World Cup finals in Chile (being the highest carrier of the title for 4 times). Few months back, its U-20 team competed in the FIFA U-20 World Cup finals in New Zealand. About that same time, its senior female team, the Super Falcons, having represented Africa as one of few African teams in Canada for the FIFA Female World Cup, in recent weeks competed for the continent’s ticket for Rio 2016 Olympics (Brazil), though crashed out to Equatorial Guinea over a two-legged qualifier. As I pen this piece, its junior team, the Super Falconets (Female Under U-20) remain on course to qualify for next year’s FIFA Women’s World Cup in Papau New Guinea. All these add up to the country’s recent full participation in the 4th Edition of the All African Games held in Congo Brazzaville where it competed in various sporting disciplines. Back home, one doesn’t have to be a sports analyst to know that the root cause of our country’s slow progress over the past long years in sports, particularly, football, has been the lack of a detailed plan. The lack of a plan to effectively cater to the various levels of football, for instance, has buried our nation’s recognition in the game of football. So even if there emerges a ‘formidable’ football squad, like was the case of the much-talked about Weah XI, a huge void is left after such squad would have diminished. This is so much so that the LoneStar would remain underdogs and under-performers for such long a time that even the zeal among Liberians to cheer their own team varnishes. Howbeit, it seems that Liberians are now on course to enjoying not just the beautiful game of football again but also other various sports. That relief would be because of the recent action by the country’s Youth and Sports Minister. The submission of a five-year plan by Sports Minister Lenn Eugene Nagbe, in my mind, comes at the right time when Liberians are once again awakening to the fortune of football. And to crown that, unveiling such a plan on an occasion that marked the celebration of the LoneStar’s ‘welcome back’ treat after its historic away win against Guinea Bissau is great. 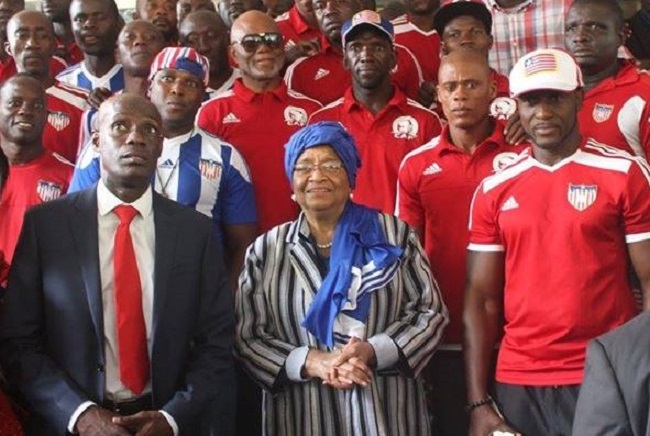 Minister Nagbe’s presentation of what I would call the Nagbe Plan to the country’s Chief Patron of Sports, President Ellen Johnson Sirleaf would go a very long way in repairing all those deficits our nation and people have suffered in the world of sports, particularly their much cherished football. That the Nagbe Plan seeks to strengthen youth soccer programs such as Under 12, 17, and 20 through the construction of a soccer academy to build the capacity and talents of young and potential Liberians is a welcomed development which must not just be embraced by all, but MUST BE SUPPORTED BY ALL. This is because the plan would produce the next generation of great footballers for our lads whose intention is to make football a profession. That plan is also good news for those whose God-given talents lie in other sports, including volleyball, table tennis, basketball and boxing. This is because they too who have interests in such sports would now have a chance to make them those sports their professions once the plan pushes through. With the Nagbe Plan, Liberia, even if not able to at once produce national football teams at six different levels like Nigeria, would be able to have competitive national football teams at atleast four different levels. With this plan, Liberia, probably because of its small population wouldn’t be among the first ten (10) highest suppliers of professional footballers in the world (like recent report that ranks Nigeria 5th highest), but would be among the first 15 highest suppliers of professional footballers in the world’s recognized leagues. It’s time to hail the Nagbe administration because with his plan, Liberia is poised to not repeat the recent ugly ‘football kids trafficking’ to Laos and other parts of the world for which our nation made the wrong headlines in both global sporting and headline news. With such an envisaged football academy, as spelt out in the Nagbe Plan, this would definitely tap the talents of all talented kids nationwide.